Can Watching Racist Viral Videos Give You PTSD? 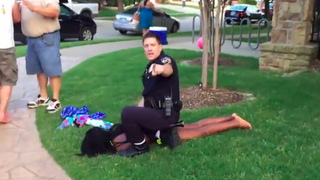 A pool party in McKinney, Texas, June 5, 2015, had the nation’s attention after video showing a white police officer pulling his gun on several black teens at the party went viral. News of overwhelming racial violence has become all too common. It seems to never stop. This week, the FBI opened investigations into suspected arson at black churches in five Southern states. Last week, President Barack Obama eulogized South Carolina state Rep. Clementa C. Pinckney and other members of the Emanuel African Methodist Episcopal Church in Charleston who were shot dead June 17 as they gathered for Bible study. And three weeks ago, there was the infuriating and traumatic viral video of Eric Casebolt, a McKinney, Texas, police officer, grabbing teenager Dajerria Becton by her hair and pushing her onto the ground as she cried for her mother. Too frequently, these events rise up and fall out of the news cycle, but the harmful psychological effects linger. As our nation commemorates National Minority Mental Health Month this July, my organization, the Black Women’s Health Imperative, is working to empower black women by prioritizing their emotional and physical health. This includes how their health is impacted by the daily violence inflicted upon the black body that they consume every night on the news and every day on social media. Research has shown that stress and trauma from racially motivated events create reactions in black women that are similar to post-traumatic stress disorder. These reactions include depression, lack of sleep, anger and an inability to get thoughts about what happened out of one’s mind. The short-term and long-term impact of the stress that racial violence places on black women is well-documented. Allostatic load, the technical term for the physiological consequences of chronic exposure to stress, is at the heart of a number of adverse health effects that disproportionately impact black women, including increased cortisol levels, higher rates of obesity/overweight and higher rates of low-birth-weight babies. This stress essentially weathers and ages the body, and can lead to premature mortality. A significant part of health and wellness for black women, particularly in the context of reproductive justice, is ensuring that they have the ability and right to raise their children in a healthy, safe environment. The stress and trauma of witnessing repeated acts of racial violence suggest that we have a long way to go before black women feel confident that they have an equal part in access to reproductive justice. Each of us can empathize and relate to what Felecia Sanders must have felt as she shielded her 11-year-old granddaughter from Dylann Roof when the alleged gunman opened fire on the Emanuel AME fellowship hall. We understand her willingness to sacrifice herself in order to save her granddaughter. While anger and outrage are normal responses to news stories like that of burning black churches or racial profiling, we’ve seen effective ways to channel these emotions and be proactively engaged in promoting change in communities. For example, amid political discussions over the appropriateness of the Confederate flag, which flies over the South Carolina Statehouse grounds, Brittany “Bree” Newsome climbed the flagpole and took it down herself. Professor Blair L.M. Kelley created the #WeHelpOurselves hashtag to highlight the pioneering and historic strides black women have taken throughout history to be positive icons for change, while other examples include the founders of #BlackLivesMatter—Alicia Garza, Patrisse Cullors and Opal Tometi—and Mary McLeod Bethune, who founded Bethune-Cookman University with $1.50 and five little girls as her first students. Unfortunately, the news of racial violence and the effects of these experiences do not appear to be slowing down. But we are part of a community that has always shown resilience in response to heartbreaking stories that might otherwise threaten to permanently damage us emotionally and physically. Reminding our children that they are loved and valued and that we will do all we can to keep them safe is another way to manage the effects of these events. We also believe that staying connected to the legacy of the unbent and unbowed black women who came before us will provide us with additional strength for the journey. History reminds us, no matter what the future holds, that we have the individual and collective power to help ourselves heal from the ongoing threats of despair and hopelessness. Through our work at the Black Women’s Health Imperative, the nation’s only organization focused solely on the total health and wellness of the nation’s black women, we are proud to invest in communities and individuals committed to making the safety of black girls and women a national priority. The stressful, traumatic news may never slow down, but neither will our efforts to ensure that black women live safe, full and healthy lives. Linda Goler Blount is president and CEO of the Black Women’s Health Imperative, a national nonprofit providing programs that support the physical, emotional and financial health of black girls and women of color. She is also a Public Voices fellow of the OpEd Project.